The program for the 100 year memorial ceremony remembering Roderick Perry Taylor and the 564 persons who lost their lives on the R.M.S. Leinster. The event was put together by the Geneva Historical & Genealogical Society, Inc. The four-page program contains a description of Charles S. Lee, whose dictated account provided the basis for understanding Taylor's story, an outline of the ceremony's events, and a description of the sinking of the R.M.S. Leinster. Original 4-page black and white program: RICHES, University of Central Florida, Orlando, Florida. Digital reproduction of original program. Genealogical Society, Inc. and is provide here by RICHES for educational purposes only. Cravero, Geoffrey. 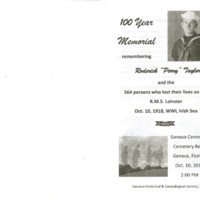 “100 Year Memorial Remembering Roderick "Perry" Taylor.” RICHES of Central Florida accessed April 22, 2019, https://richesmi.cah.ucf.edu/omeka/items/show/10420.